“The hour drew nigh and the moon was rent in twain. They denied (the Truth) and followed their own lusts. According to Maududi, the traditionists and commentators have agreed that this incident took place at Mina in Makkah about five years before the Holy Prophet’s Hijra (migration) to Madinah. The Moon had split into two distinct parts in front of their very eyes. The two parts had separated and receded so much apart from each other that to the on-lookers (in Makkah) one part had appeared on one side of the mountain and the other on the other side of it. Then, in an instant the two had rejoined. This was a manifest proof of the truth that the system of the universe was neither eternal nor immortal, it could be disrupted. Did it happen or will it happen? Explanation No. 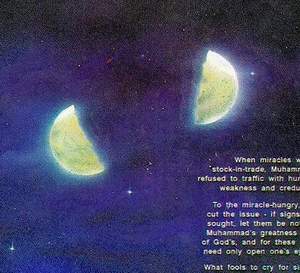 1: (Moon once appeared cleft asunder in Mecca). In this Surah the disbelievers of Makkah have been warned for their stubbornness which they had adopted against the invitation of the Holy Prophet (peace and blessings of Allah be upon him). The amazing and wonderful phenomenon of the splitting of the Moon was a manifest sign of the truth that the Resurrection, of which the Holy Prophet was giving them the news, could take place and that it had approached near at hand. The great sphere of the Moon had split into two distinct parts in front of their very eyes. The two parts had separated and receded so much apart from each other that to the on-lookers one part had appeared on one side of the mountain and the other on the other side of it. Then, in an instant the two had rejoined. This was a manifest proof of the truth that the system of the Universe was neither eternal nor immortal, it could be disrupted. Huge stars and planets could split asunder, disintegrate, collide with each other, and everything that had been depicted in the Qur’an in connection with the description of the details of Resurrection, could happen. Explanation No. 2: (The cleaving of the moon will happen in the future). Most of the commentators see in this verse a reference to a phenomenon said to have been witnessed by several of the Prophet’s contemporaries. As described in a number of reports going back to some Companions, the moon appeared one night as if split into two distinct parts. While there is no reason to doubt the subjective veracity of these reports. But whatever the nature of that phenomenon, it is practically certain that the above Qur’an-verse does not refer to it but, rather, to a future event: namely, to what will happen when the Last Hour approaches. (The Qur’an frequently employs the past tense to denote the future, and particularly so in passages which speak of the coming of the Last Hour and of Resurrection Day; this use of the past tense is meant to stress the certainty of the happening to which the verb relates.) Thus, Raghib* regards it as fully justifiable to interpret the phrase inshaqqa ‘l -qamar (“the moon is split asunder”) as bearing on the cosmic cataclysm – the end of the world as we know it – that will occur before the coming of Resurrection Day (see art. shaqq in the Mufradat). As mentioned by Zamakhshari,** this interpretation has the support of some of the earlier commentators; and it is, to my mind, particularly convincing in view of the juxtaposition, in the above Qur’an-verse, of the moon’s “splitting asunder” and the approach of the Last Hour. (In this connection we must bear in mind the fact that none of the Qur’anic allusions to the “nearness” of the Last Hour and the Day Of Resurrection is base on the human concept of “time”.) (Page 818). This line of approach does not give a particular preference to any one of the above two explanations. It opens a third door. Allah alone knows the Truth and may He forgive us for our errors. The wonders of the Qur’an never finishes. Allah said in the Qur’an [41:53] ‘We will show them Our Signs in the universe, and in their ownselves, until it becomes manifest to them that this (the Qur’an) is the truth. Is it not sufficient in regard to your Lord that He is a Witness over all things?’. Some one asked Prof. Zaghloul Al-Najjar about the miracle mentioned in the beginning of Sura Al-Qamar (the moon) about the split of the moon [54:1] ‘The Hour has drawn near, and the moon has been cleft asunder (the people of Makkah requested Prophet Muhammad SAW to show them a miracle, so he showed them the splitting of the moon)’. The question was whether there is any scientific evidence discovered to explain the incident? The answer was that the miracle existed only at that time for the people of Quraiesh when they challenged the prophet Muhammmad (saw) to show them a miracle, or a proof that he is the messenger of Allah. The challenge was to split the moon in to two pieces when it is full. The incident of the splitting of the moon that has been mentioned determines its period of revelation precisely. The traditionists and commentators are agreed that this incident took place at Mina in Makkah about five years before the Holy Prophet’s hijra (immigration) to Madinah (about 565 AD). In this Sura the disbelievers of Makkah (Quriesh) have been warned about their stubbornness which they had adopted against the invitation of the Holy Prophet (peace and blessings of Allah be upon him). The prophet (PBUH) prayed to Allah to show his people this miracle that they might believe in him. The answer of Prof. Al-Najjar was limited to this incident, but one of the audience called David Mosa Pidcook (leader on British Muslim Party) asked to comment on this question and he said: It was shown in BBC a program where there was a debate between three experts. The discussion was about if the amount of money paid by NASA to send a human to land on the surface of the moon to study the inner structure of the moon was worth it or not?? The American government authorised a budget of $100, 000, 000, 000 (one hundred thousand million dollar) for this project. Finally, I would like to request every one to try to order the program from the BBC and get more conformation on this subject. You have the permission to send and propagate this information to any one you like. The king spent weeks in seclusion. In the midst of his quiet life, he set out on the journey along with the Arab travelers who’d promised him earlier. On the way, they stopped by Koylandi and from there to Dharmapatnam where they halted for 3 days. Then they set out to Shehr Muqalla. On reaching there, they set for the Hajj pilgrimage and thereafter returned to Malabar. He aspired to spread the message of Islam. But on the way, he fell sick and breathed his last. Umar Qazi’s poem on Cheraman Perumal. Umar Qazi was well aware of the story of Cheraman Perumal – the first Indian to accept Islam. He narrates it thus in one of his poems inscribed on the walls of Ponnani Juma Masjid. Kodungallur was a center of festivals established by the great Emperor Cheraman Perumal …..
As such, one day he saw he saw the moon split into two (a miracle of Holy Prophet performed in Arabia) on a clear cloudless night …. As a result the love for Holy Prophet grew in his heart and he became the earliest Muslim of this nation…. The hour drew nigh and the moon was rent in twain. Yet everything will come to a decision. This incident indicated that huge stars and planets could split asunder, disintegrate, collide with each other, and everything that had been described in the Qur’an on the Resurrection could happen. The Holy Prophet (peace and blessings of Allah be upon him) invited the people’s attention to this event only with this object in view and asked them to mark it and be a witness to it. But the disbelievers described it as a magical illusion and persisted in their denial. They were reproached in Surah Al-Qamar (The Moon) for their stubbornness. It is due to this incident about their king, the people of Malabar became the first community in India to accept Islam. Subsequently, they increased their trade with Arabs, as the Arab ships used to pass by their shores on the way to China before the advent of Prophet Muhammad (pbuh). Before Prophet Muhammad (pbuh), Malabar also had a Christian community dating back from the earliest followers of Prophet Jesus (‘Isa), pbuh. St. Thomas is believed to have migrated to India and died there. This community remained untouched by later theological developments in Christianity until the arrival of Portugese traveler Vasco da Gama. When the British were consolidating their stronghold in India, they deployed the largest naval operation (on the shores of India) against the Muslims of Malabar. Prophet Muhammad (Pbuh) was commanded by God to inform that he was not the only Messenger of God to the world [Al Qur’an 46:9]. Scholars say that there had been some 124,000 Prophet sent to the world who preached in the language of the respective people [A Qur’an 14:4]. The true religion they preached and their scriptures got corrupted with passage of time (with the exception of Al Qur’an). However, the message on the last and greatest Prophet Muhammad (Pbuh) is retained till date in the scriptures of all major world religions. The Hindu scriptures identify the greatest Prophet to come mentioning details of his birth, events of his life, his followers, etc. Some even give his Arabic name or its equivalents! This article will help creating right belief (Iman) in other religionists. Further, it will help Muslims appreciate yet another facet of greatness of Prophet (Pbuh) and deepen their Iman. We will see here only a sample of the overwhelming evidences! There is no doubt that God sent Prophets (Pbuh) to people of India. There is no mention of any Indian Prophet or scripture in Holy Qur’an. But Bukhari records Prophet Muhammad (Pbuh) as saying he was enjoying breeze wafting from India laden with fragrance of Tawhid (unity of God). The four Vedas (scriptures) of Hindus and their epics are said to be 5000-10,000 years old. They contain a great deal of monotheistic ideas, and of course, prophecies on Hadrath Muhammad (Pbuh). This is a Sanskrit work of prophecies. The title means ‘Book of the Future’. Since Hinduism is based in India it was, and still is, taken for granted that its sages will be born in India itself. Contrary to this belief the Book says that a great master will appear in a foreign country (mlechcha acharya) and live in a sandy region (marusthal). His name will be Mahaaamad. Within a short span of 18 couplets Mahaamad is mentioned five times. This is a Hindu epic describing the struggle and triumph of good against evil. It was written by sage Vyas who also authored Bhavishya Purana. Mahabharata says that in the last eon called Kali Yug (in which we now live) a great sage will appear with name Mahaamad. He would preach about unity of God. He will be driven away from his native place by his own folk. By him the world would get peace. (Islam means peace). Mahabharat further says that cloud will provide him shade. It is recorded in history that Buhaira, the Christian priest of Syria observed this sign with Muhammad e in his boyhood and identified him as the last Prophet anticipated for millennia. § Kalki will appear in the last on Kali Yug and will be the guide for the entire world. § He will be born on the 12th day of the month. Prophet (Pbuh) as born on 12th Of Rabiyyul Awwal). § He will be with a beauty par-excellence. His body will be fragrant. § Kalki will split the moon. Like Bhoj, Cheraman (Zamorin) Perumal the ruler of Indian kingdom of Kerala, witnessed splitting of the moon performed by Prophet (Pbuh). After gathering the facts he sailed to Arabia and became Muslim at Prophet’s (Pbuh) hand. His Tomb is near the city of Salala in Oman. See: “Cheraman Perumal The First Indian To Accept Islam” at http://jaihoon.com/watan/perumalfirst.htm. 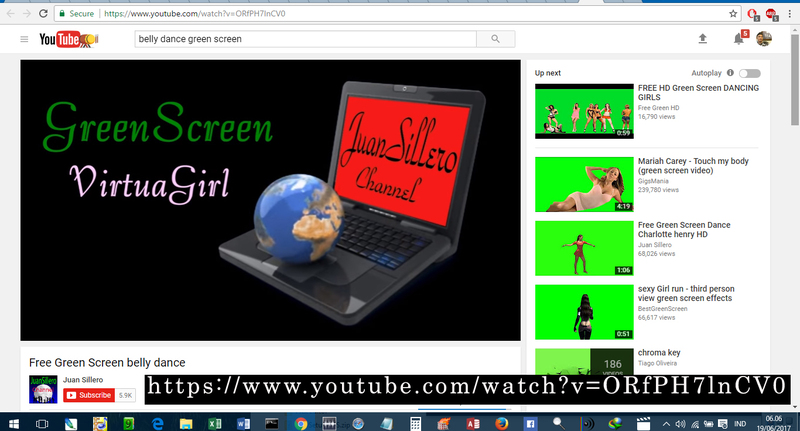 See: “Ultimate Prophet (Pbuh) Foretold” by M. I. Liaqat Ali at http://www.geocities.com/WestHollywood/Park/6443/Muhammed/scriptures.html. The 87-year-old Raja Valiyathampuram of Kodungallur in Central Kerala is a descendant of King Cheraman Perumal, the first Indian to embrace Islam in the early 7th century. Talking to him is like talking with history. In the following interview taken by A U Asif (right in the picture) in Ernakulam, he dwells in detail upon his great early ancestor and the oldest mosque (above) of the sub-continent. He also asks North Indians to come to Kerala and see how people of different religions are living there for centuries in an atmosphere of harmony, fraternity and peace. How do you take your great great grandfather Cheraman Perumal? Cheraman Perumal was not only a king and my ancestor, but the first Indian to come into the fold of Islam. He was actually the person who gifted Islam and the first ever mosque to the Indian sub-continent. This happened much before the advents of Muhammad bin Qasim and Mahmood Ghaznavi. This shows that Islam didn’t come to India with the sword. As is well known in Kerala, on a moon-lit night the king while walking on the rooftop of his palace along with the queen saw the moon suddenly splitting into two halves. Later he came to know through the Arab traders that that a prophet called Muhammad had wrought a miracle on that fateful night and sundered the moon before a crowd of dazed spectators. Impressed by this new messenger of God in Arabia, the king set out for the holy land after dividing his kingdom and assigning various territories to local chieftains to ensure smooth governance. In Arabia he met the Prophet and embraced Islam in the presence of Abu Bakr Siddique, who later became the first caliph. Cheraman, who took a Muslim name, Tajuddin, died on his way back to India and was buried on the shore of the Arabian Sea at Salala in the Sultanate of Oman. It is said that he had earlier written letters to the local rulers of Malabar and sent it through his ministers along with Malik bin Dinar, a companion of the Prophet. In the letters he had asked them to “receive the bearers of the letters and treat them well and help them to construct mosques at Kodungallur and elsewhere”. The rulers of Kerala honoured the letters and permitted Malik Bin Dinar and his fellow Arab traders to build mosques in Kerala. The mosque built in the early 7th century at Kodungallur, known as Cheraman Malik Masjid, still exists with its original structure and is said to be the oldest mosque in the sub-continent. It is named after both Cheraman Perumal and Malik bin Dinar. Is the mosque intact with its original structure? Yes, the original structure, including the sanctum sanctorum, remains intact. However, there have been a few extensions in the past. Its front portion is new while the back portion with its sanctum sanctorum, mehrab, mimbar (pulpit), wooden work on the roof of mimbar and traditional lamp as well as the ancient ceremonial pond, is still untouched. Anything more about Malik bin Dinar? After the construction of the mosque at Kodungallur, Malik bin Dinar moved towards Mangalore and died at Kasaragod, now in Karnataka, where rests in peace. Interestingly, Cheraman Perumal and Malik bin Dinar are buried on two sides of the Arabian Sea, one at Salala in the Sultanate of Oman and the other at Kasaragod in India. In other words, their graves are interlinked by the waters of the sea. There exist 14 mosques of the same pattern and design from Kodungallur to Mangalore. How do you see all this? We see all this with pride. There is no question of any ill-feeling about Cheraman Perumal. We have high regard for him. He was our patriarch. He embraced Islam but could not come back from Arabia as he fell ill and died on way. I hail from his lineage and have faith in Hinduism. How do the general people, particularly Hindus consider Cheraman and his gift in form of the first ever mosque in the Indian sub-continent? People belonging to different religions, including Hindus, hold him in high esteem and the mosque built as per his wish as a historical monument. The historic mosque has been visited by numerous dignitaries over the centuries and decades. President Dr A P J Abdul Kalam was recently here. He was given a warm reception in the mosque. I was also among those present on the occasion. Unlike north India, there is no communal strife over places of worship in South India? Setiap Nabi dan Rasul Allah memiliki kelebihannya tersendiri didalam menjalankan misi mereka kepada umatnya, tapi walau demikian, al-Qur’an justru melarang manusia untuk membeda-bedakan mereka, sebab kesemuanya adalah utusan Allah yang Maha Agung. Dan hanya Allah sajalah yang berhak untuk menilai derajat dari masing-masing Nabi-Nya itu, aturan tersebut berlaku kepada siapa saja tanpa terkecuali kepada Nabi Muhammad Saw selaku Nabi terakhir. Masing-masing Nabi dan Rasul Allah itu memiliki misi yang sama, mengajarkan kepada umatnya mengenai Tauhid, bahwa Tidak ada sesuatu apapun yang wajib untuk disembah melainkan Allah yang Esa, berdiri dengan sendirinya, tanpa beranak dan tanpa diperanakkan alias Esa dengan pengertian yang sebenar-benarnya, bukan Esa yang Tiga alias Tritunggal. Masing-masing utusan Allah itu diberi kelebihan tersendiri yang lebih dikenal dengan nama “Mukjizat”, dimana tiap-tiap mukjizat ini diberikan sesuai dengan konteks jaman, kebudayaan dan cara berpikir manusia kala itu, meskipun ada juga beberapa mukjizat yang sama yang dimiliki antar Nabi dan Rasul Allah tersebut. “Ucapkanlah: “Kami beriman kepada Allah dan kepada apa yang diturunkan kepada kami dan yang diturunkan kepada Ibrahim, Isma’il, Ishaq, Ya’qub, dan anak-anaknya, dan apa yang diberikan kepada Musa, ‘Isa dan para Nabi dari Tuhan mereka. Kami tidak membeda-bedakan seorangpun di antara mereka dan hanya kepada-Nya-lah kami menyerahkan diri”. Tegas dan gamblang sekali penyataan ayat al-Qur’an diatas. Ayat 3:84 ini dimulai dengan kata perintah penegas : Kul [Katakan!]. Siapa yang disuruh oleh Allah ini ? Jawabnya adalah merefer pada umat Muhammad Saw, yaitu kita kaum Muslimin seluruhnya. Mari kita periksa ayat tersebut yang secara nyata mewajibkan bagi umat Muhammad menghilangkan rasa diskriminasi kenabian. Lanufarriku bayna ahadimminhum = dan kami [umat Muhammad] tidak membeda-bedakan diantara mereka [yaitu para Nabi dan Rasul itu]. Sekali lagi, ayat al-Qur’an diatas menafikan kerendahan derajat seorang Nabi dan Rasul dengan Nabi dan Rasul Allah yang lainnya, dan itu diberlakukan secara menyeluruh dengan kalimah “Lanufarriku bayna ahadimminhum”. Membandingkan antar Nabi yang satu dengan Nabi lainnya seperti yang dilakukan oleh banyak jemaah dan manusia rasanya adalah sudah melampaui apa yang diperintah oleh Allah sendiri dalam al-Qur’an, dan bertindak demikian berarti kita telah menyalahi al-Qur’an (dengan istilah kasarnya kita telah berdosa karena mengabaikan perintah al-Qur’an). Bukan pada tempatnya bagi manusia untuk menilai kemuliaan derajat antar para utusan Allah sebab memang manusia pada dasarnya tidak pernah tahu dan tidak pernah mengerti mengenai hal tersebut, penegasan 3:84 ini diulang kembali oleh Allah pada ayat 2:136. Pada ayat 2:253, 17:55 Allah dengan tegas mengatakan bahwa hanya Dia-lah yang patut mengadakan penilaian ketinggian derajat antar Rasul-Nya. Dan hal ini memang sudah sewajarnya sebab hanya Dia-lah yang lebih mengetahui dan memiliki otoritas penuh dalam menilai apa dan bagaimana karakter masing-masing utusan-Nya itu. Kita sering mendengar adanya orang menyebut : “Nabi besar Muhammad…”, jika begitu apakah ada Nabi kecil ? Tidakkah itu juga sudah melanggar apa yang diperintahkan oleh al-Qur’an diatas untuk tidak melebihkan antara para Nabi dan Rasul ? Dalam catatan sejarah al-Qur’an dipaparkan bahwa Allah telah melebihkan serta memuliakan para Nabi-Nya seperti Musa [7:144], Daud dan Sulaiman [27:15], Isa Almasih [3:45-46], Muhammad [94:4], Ibrahim [2:124] dan lain sebagainya [Nuh, Ayyub, Harun dll] yang kesemuanya tercantum dalam ayat 4:163, 33:7 dan berbagai ayat lainnya yang tersebar dalam al-Qur’an. Membeda-bedakan para utusan Allah dalam sudut pandang apapun hanya akan menyebabkan diskriminasi yang berkepanjangan yang dapat menyebabkan manusia terjerumus mendewakan salah satu dari mereka dan mencampakkan yang lainnya sehingga menimbulkan fitnah, khurafat dan pelecehan kepada mereka. Semua Nabi dan Rasul sebelum Muhammad wajib untuk dihormati, mereka semua adalah orang-orang yang suci dan telah mengantarkan kaumnya kepada peradaban yang mengenal nilai-nilai keTuhanan dan juga sebagai penyampai khabar gembira akan kehadiran Rasulullah Muhammad Saw selaku Nabi penutup. Mungkin memang itu adalah salah satu bentuk kecintaan kita kepada Nabi Saw, namun jika apa yang kita lakukan itu justru tidak sesuai, apakah hal ini masih bisa diterima ? Bagaimana pendapat anda jika demi untuk mencari keridhoan Allah maka sholat subuh kita tambah menjadi 4 raka’at ? Ditinjau dari satu sudut, penambahan raka’at ini memang baik, tapi ditinjau dari sudut yang lain, maka tindakan ini salah dan tidak dibenarkan, sholat kita bukan diterima tapi malah ditolak. Pada ayat diatas juga disebutkan bahwa “Orang yang Beriman kepada Allah dan para Rasul” ditekankan dengan penambahan kalimat “Dan tidak membedakan seorangpun di antara mereka”. Setelah sadar kita melakukan kesalahan, kita koreksi diri kita sendiri agar tidak mengulanginya kembali dilain waktu maka bertaubatlah kepada Allah atas kesalahan yang kita buat maka niscaya, jika kita ikhlas melakukannya, maka Allah akan mengampuni kita. Pak Hendy, anda bilang bhw SEMUA nabi hanya melakukan SATU mujizat. Mnrt kepercayaan Kristiani, Yesus banyak melakukan mujizat: merubah air menjadi anggur, menyembuhkan berbagai penyakit chronic, membuat orang buta sejak lahir melek, orang lumpuh selama puluhan taon jadi bisa jalan, perempuan yg menderita perdarahan selama tahunan tiba2 sembuh, orang yg sudah mati beberapa hari sudah busuk/bau – ketika dipanggilnya keluar dan segar bugar, nempelin telinga penangkap dia yg dibabat pedang oleh Petrus kembali, dst. Kesemuanya dia lakukan krn Yesus memang Tuhan! Lagipula, setahu saya, yesus tidak pernah mengklaim dirinya sendiri sebagai Tuhan … semua mukjizat yang beliau lakukan adalah karena atas izin Allah, dia sendiri gak bisa berbuat apa-apa ( silahkan cari sendiri ayat-ayatnya di Perjanjian Baru anda -biar saya tidak dianggap menggurui anda tentang agama anda sendiri ). Sahabat Nabi tidak selamanya benar ! Pada tulisan kali ini saya akan mengajak anda berpikir dengan jernih mengenai permasalahan ‘ADALATUS SHAHABAH (Keadilan para sahabat) ini sehingga anda pun bisa mengerti jalan pemikiran saya dan juga bisa membangkitkan adrenalin anda untuk mau berpikir kritis tentang doktrin-doktrin yang ditanamkan dikepala kita selama ini sehingga tidak jarang menimbulkan pengkultusan individu terhapad hal-hal maupun orang-orang tertentu, baik kita sadari atau tidak. Sebelumnya saya sudah beberapa kali juga menyinggung bahwasanya saya tidak memihak, anda boleh menyebut saya seorang syiah, anda pun boleh menyebut saya seorang muktazilah, anda boleh juga menyebut saya sunni tetapi buat saya pribadi penyebutan seperti itu tidak penting, yang saya pahami, Islam adalah Islam, tidak ada madzhab dalam Islam. Madzhab adalah cara pandang terhadap sesuatu yang akhirnya menjadi thariqah untuk pengamalannya. Adalah bisa dimengerti dan dipahami selama itu tidak menjerumuskan pada tingkat saling pengkafiran apalagi saling bunuh. Jika terhadap orang kafir saja kita dilarang berbuat zalim, apakah lagi kepada sesama muslim. Bila kita melihat saudara kita berbeda pemahaman dengan apa yang kita pahami, mari dialog, buka hati dan buka pikiran, pergunakan dalil yang obyektif sehingga tidak terjebak dalam debat kusir yang hanya berdasarkan emosional semata, sebab tindakan emosional tidak akan mengantarkan pada pemecahan masalah yang baik. Dan berangkat dari ayat ini, maka berikut akan saya uraikan pemahaman saya mengenai sifat ‘ADALATUS SHAHABAH, mohon maaf apabila banyak nantinya yang merasa tersinggung dengan tulisan ini, silahkan anda mendebat tulisan saya ini dengan dalil-dalil pula dan bukan sekedar menurut anggapan anda atau ulama anu dan syaikh anu. ‘ADALATUS SHAHABAH artinya sifat keadilan sahabat, beberapa ulama hadis mempersempit makna ini menjadi kebersihan semua shahabat dan keterbebasan mereka dari perbuatan salah, mulai dari tindakan hingga pada ucapannya. Penyempitan defenisi ini akhirnya menimbulkan tindakan taklid berlebihan terhadap diri para sahabat Nabi, semua kajian keagamaan akhirnya seringkali tidak obyektif dan manakala ada pihak yang mencoba melakukan kritik terhadap para sahabat maka orang itu beramai-ramai langsung dicap kafir, sesat, munafik, sok mulia dan sebagainya. Akhirnya terjadilah jurang didunia Islam secara berabad-abad antara kaum ahlussunah yang berkesan mendewakan sahabat dengan kaum Syiah yang berkesan banyak memunafikkan sahabat dan malah ada yang ekstrim sampai mengkafirkannya. Padahal masalah ini bisa kita bawa secara obyektif dengan terlebih dahulu menanggalkan semua bentuk kefanatikan kita terhadap masing-masing pemahaman. Kitab suci al-Qur’an banyak memberikan contoh bagaimana seorang Adam, seorang Musa, seorang Yunus dan seorang Muhammad terlepas dari status kedekatan dan hubungannya dengan Allah ternyata mampu melakukan kesalahan-kesalahan manusiawi sebagaimana fitrah dari kemanusiaan itu sendiri. Bahkan dalam banyak ayat di al-Qur’an betapa Nabi disuruh mengulang-ulangi ucapan : Aku ini manusia biasa seperti kamu tetapi aku diberi wahyu … artinya apa ? tidak lain ini sebagai bentuk teguran kepada manusia lain diluarnya bahwa sesaleh apapun seseorang namun selama dia bernama manusia, dia tidak akan bisa melepaskan semua sifat-sifat kemanusiawiannya. Ada kalanya mereka mengeluh, ada kalanya mereka menangis sedih, ada kalanya mereka tertawa, bersenda gurau, marah, gusar, terluka bahkan terbunuh … semua ini ada ayatnya dalam al-Qur’an dan ini sangat rasional sekali, sangat kausalitas. Lalu bagaimana mungkin seseorang diluar para utusan Allah tersebut bisa dijadikan maksum, terlepas dari cacat ? ini semua perlu kajian lebih jauh, lebih mendalam, ada yang salah dari cara kita memahami nash-nash yang tertulis sehingga berkesan Islam itu penuh konflik kontradiksi internal. Tidak adanya pertentangan yang banyak bukan berarti ada pertentangan yang sedikit, kenapa ? Berarti saat kita menemukan adanya konflik didalam ajaran Islam sebenarnya konflik itu ada pada diri kita sendiri, bukan pada ajaran Islam. Sederhana sekali, untuk memahami agama kita hanya dituntut untuk mengerti fitrah kita, fitrah manusiawi. Jangan berpikir untuk menjadikan diri kita berfitrah malaikat sebab kita memang bukan malaikat dan memang Allah tidak hendak menjadikan kita sebagai malaikat, oleh karena itu pula jangan menganggap orang lain sebagai malaikat, kembalikan fitrah mereka pada haknya. Para sahabat adalah manusia dan mari kita memahami mereka sebagai manusia … inilah fitrah. Benar bahwa kita harus memperlakukan mereka secara terhormat, bagaimanapun diantara mereka banyak yang berjuang atas dasar penegakan Iman, mereka gugur di Badar, merekapun gugur di Uhud dan diberbagai peperangan penegakan panji-panji Allah yang lainnya. Tanpa mereka seorang Muhammad tidak akan bisa berbuat banyak, Islam bisa sampai pada kita karena jasa mereka, ini tidak perlu dipungkiri, karena itu Allah dan Rasul-Nya pun banyak mengeluarkan pujian untuk mereka. Akan tetapi … jangan berhenti sampai disini. Karena pembelajaran kita memang belum harus berhenti, ada banyak hal yang menggelitik hati kita apabila melihat fakta sejarah yang berlaku dan melibatkan para sahabat. Apakah sikap para sahabat yang berebut kekuasaan, para sahabat yang haus kekuasaan, para sahabat yang memenggal kepala cucu Nabi tercinta, para sahabat yang terlibat konflik berdarah sesamanya, para sahabat yang memaki-maki keturunan Nabi … tetap disebut bersifat ‘adalah (adil, bersih) ? Apa benar membunuh sesama saudaranya seiman disebut sebagai tindakan ikhtilafiah ? Saya kok tidak yakin Allah dan Rasul-Nya meridhoi perbuatan-perbuatan para sahabat yang saya sebutkan tadi. Anda bacalah al-Qur’an, anda bacalah sirah Nabawiah … anda analisa dan renungkan kebenaran dari apa yang saya katakan ini. Padahal kata umat diayat-ayat tersebut merujuk pada kaum secara umum. Jadi disini tidak hanya berhubungan dengan sahabat saja, saat Allah menyebut umat terbaik, maka maksudnya disini adalah umat Islam, dan jika sudah berbicara masalah umat Islam maka berarti berbicara mengenai orang banyak, terlepas dari rentang ruang dan waktu. Baik dahulu sekarang maupun umat Islam yang akan datang. Praktis, penerapan hukum terhadap umat adalah sama, tidak ada kecuali. Jika salah ya salah. munafik ya munafik. Shahih Bukhari 6098: Telah menceritakan kepada kami Ahmad bin Shalih telah menceritakan kepada kami Ibnu Wahab mengatakan; telah mengabarkan kepadaku Yunus dari Ibnu Syihab dari Ibnul Musayyab; bahwasanya ia menceritakan dari beberapa sahabat Nabi, bahwasanya Nabi shallallahu ‘alaihi wasallam bersabda: “Beberapa orang sahabatku mendatangi telaga, lalu mereka dijauhkan dari telaga, maka aku berkata; ‘(mereka) para sahabatku, ‘ Allah menjawab: ‘Sungguh engkau tidak mempunyai pengetahuan tentang apa yang mereka kerjakan sepeninggalmu, mereka berbalik ke belakang dengan melakukan murtad, bid’ah dan dosa besar.” Dan Syu’aib mengatakan dari Az Zuhri, Abu Hurairah menceritakan dari Nabi shallallahu ‘alaihi wasallam dengan redaksi; ‘yujla`un’ sedang Uqail mengatakan dengan redaksi ‘Fayuhalla`uuna’, sedang Zubaidi mengatakan dari Az Zuhri dari Muhammad bin Ali dari Ubaidillah bin Abi Rafi’ dari Abu Hurairah radliyallahu’anhu. Dalam [Q.S. At-Taubah 101], Allah berfirman : “Dan di antara orang-orang badui di sekelilingmu, ada orang munafik, dan juga di antara penduduk Madinah. Kamu (Muhammad) tidak mengetahui mereka. Kamilah yang mengetahui mereka. Kami akan siksa mereka dua kali kemudian mereka akan diberikan azab yang besar”. Ibn Katsir menafsirkan ayat tersebut, bahwa ayat tersebut ditujukan untuk beberapa sahabat Rasul Saw yang munafik. Rasul Saw tahu bahwa penduduk Madinah yang menggaulinya dan dilihatnya tiap pagi dan senja, ada orang-orang munafik. Dalam [Q.S. Jumuah 11], Allah mengecam para sahabat yang meninggalkan Rasul Saw, yang sedang ber-khutbah jum’at, demi menyambut kafilah yang membawa barang dagangan. Jabir bin Abdullah berkata :”Ketika Nabi Saw sedang berkhotbah jum’at, tiba-tiba datang kafilah dagang di Madinah, maka pergilah sahabat menyambut kafilah dagang itu, sehingga tiada sisa yang mendengarkan khotbah Rasul Saw, kecuali 12 orang, maka Rasul Saw bersabda :’Demi Allah yang jiwaku ada di tangannya, andaikata kamu semua mengikuti keluar sehingga tiada seorangpun yang tertinggal, niscaya lembah ini akan mengalir api’. Dan turunlah ayat tersebut. “(Ingatlah) ketika kalian lari dan tidak menoleh kepada seorangpun, sedang Rasul yang berada di antara kawan-kawanmu yang lain, memanggil kalian, karena itu Allah menimpakan atas kalian kesusahan di atas kesusahan agar kalian tidak bersedih atas apa yang luput dari kalian dan apa yang menimpa kalian. Sungguh Allah mengetahui apa yang kalian kerjakan”. Musnad Ahmad 1834: Telah menceritakan kepada kami Sufyan dari Sulaiman bin Abu Muslim paman Ibnu Abu Najih, dia mendengar Said bin Jubair berkata; Ibnu Abbas berkata: “Hari kamis, dan apakah hari kamis itu?” Kemudian ia menangis hingga air matanya mengalir. -Dalam kesempatan lain Said bin Jubair berkata; sampai butiran air matanya mengalir.- maka kami bertanya; “Wahai Abu Al Abbas, kenapa dengan hari kamis?” Dia berkata; “Pada hari tersebut sakit Rasulullah shallallahu ‘alaihi wasallam semakin parah, lalu beliau berkata: “Kemarilah, aku tuliskan untuk kalian sebuah surat, sehingga kalian tidak akan tersesat setelahnya selamanya.” Namun mereka berselisih, padahal tidak pantas ada yang berselisih di dekat seorang Nabi. Mereka berkata; “Bagaimana keadaan beliau, apakah beliau mengigau? -Sufyan berkata; yaitu melantur, – hendaknya kalian tanyakan kembali kepada beliau.” lalu mereka pergi dan menyakannya kembali. Maka beliau bersabda: “Tinggalkan aku, keadaanku sekarang lebih baik daripada apa yang kalian kira.” Beliau menyuruh tiga hal -Sufyan berkata; Beliau mewasiatkan tiga hal.- beliau bersabda: “Keluarkan orang-orang musyrik dari Jazirah Arab, dan perlakukan utusan sebagaimana saya memperlakukan mereka.” Tetapi Sa’id tidak menyebutkan wasiat yang ketiga, saya tidak tahu apakah dia sengaja mendiamkannya atau karena dia lupa. Dalam riwayat lain Sufyan berkata; Bisa jadi dia sengaja tidak menyebutkannya atau melupakannya. Secara obyektifitas, sikap Umar bin Khattan tersebut memang harus diakui dengan jujur bisa dianggap sebagai suatu sikap yang sangat tidak bijak dan tidak pula patut. Dari sisi persahabatan, antara Umar dan Nabi sudah terjalin persahabatan yang cukup lama waktunya dan seharusnya membuat beliau mengenal kepribadian sang Nabi lebih baik sehingga tidak mungkin secara logika, seorang Nabi bisa meracau ataupun kesurupan sekalipun sedang dalam kondisi yang sakit. Jikapun ini bisa terjadi, pasti akan ada teguran ataupun bantuan dari Tuhan seperti kejadian-kejadian sebelumnya (lihat misalnya kisah ketika Nabi memastikan datangnya wahyu, Beliau ditegur oleh Allah, begitupula saat ada orang buta meminta pengajaran dan Beliau bermuka masam, inipun ditegur oleh Allah, apalagi bila sampai Nabi meracau dan mengatakan hal yang salah kepada umatnya, pastilah akan lebih mendapat teguran yang lebih keras lagi). Karenanya sangat masuk akal bila Nabi pun menjadi marah dan mengusir orang-orang yang ada disekitarnya waktu itu agar keluar ruangan. Dirumah sakit saja bila kita menengok teman yang sakit pasti akan dijumpai tulisan “Jangan Berisik, demi kesembuhan pasien”. Dihari wafatnya Rasul misalnya, belum lagi jenazahnya dikubur, sejumlah sahabat malah ribut dan saling merasa lebih unggul satu dengan yang lain sehingga menurutnya jabatan Khalifah harus berada ditangan mereka, jika Abu Bakar dan Umar tidak datang bukan tidak mungkin akan terjadi konflik berdarah saat itu, apakah type sahabat-sahabat yang seperti itu bisa dimasukkan kedalam kategori ‘adalah seperti yang diklaim oleh ulama hadis sebagai ‘adalah? Tanpa bermaksud untuk mencela atau menjatuhkan wibawa Thalhah dan Zubair, keduanya sahabat Nabi dan ikut berjanji setia dibawah pohon, tetapi fakta sejarah menuliskan pada kita bila mereka juga orang yang paling bertanggung jawab atas terjadinya perang Jamal yang membuat ratusan sahabat saling bunuh dan membuat ummul mu’minin ‘Aisyah r.a mengangkat pedang terhadap Khalifah Ali bin Abu Thalib r.a, bisakah dibenarkan tindakan kedua sahabat tersebut ? -menurut saya jika anda membenarkannya maka secara tidak langsung andapun membenarkan tindakan pengeboman Dr. Azhari cs yang membuat puluhan nyawa melayang dan puluhan istri serta anak kecil kehilangan orang yang mereka cintai dan menaungi hidup mereka. Selanjutnya Muawiyah bersama pengikutnya yang mengobarkan peperangan terhadap Imam Ali r.a dan menyebabkan banyak sahabat terbunuh dan lebih jauh lagi awal dari pencaci makian dan penghujatan terhadap seluruh keluarga Nabi dan pembantaian bagi para simpatisannya… apakah ini bisa dimasukkan dalam kategori sahabat yang bersifat ‘adalah ? Ingat Sunan Tirmidzi 3658: Telah menceritakan kepada kami Qutaibah telah menceritakan kepada kami Hatim bin Isma’il dari Bukair bin Mismar dari ‘Amir bin Sa’d bin Abu Waqash dari ayahnya dia berkata; “Muawiyah bin Abi Sufyan pernah mengangkat Sa’ad menjadi seorang pemimpin. Lalu dia berkata; “Apa yang menghalangimu untuk mencela Abu Turab (Ali)?” Sa’d menjawab; “Adapun tiga hal yang telah kamu sebutkan, semuanya telah disebutkan oleh Rasulullah shallallahu ‘alaihi wasallam, maka aku tidak akan pernah mencelanya. Aku lebih suka termasuk di antara tiga hal tersebut dari pada unta merah, karena aku pernah mendengar Rasulullah shallallahu ‘alaihi wasallam bersabda kepada Ali dan beliau pernah mengangkatnya sebagai wakil beliau (di Madinah) di salah satu peperangan (perang Tabuk) “. Dari beberapa kasus diatas, fakta bahwa tidak semua sahabat bisa disebut bersikap ‘adalah. Demikian kiranya sedikit pemahaman saya terhadap sifat ‘adalah para sahabat Nabi, bahwa benar mereka orang-orang yang bertemu, berbicara dan mendampingi hidup Nabi namun mereka tetap bisa salah, mereka tetap bisa bertindak bertentangan dengan ajaran Islam meski sekecil apapun itu … sebab mereka juga adalah manusia biasa. Allah dan rasul-Nya suka mencela orang-orang yang zhalim, tetapi sebagian besar umat Islam tidak suka apabila orang tersebut dari ‘sahabat’ Rasul. Seakan-akan menganggap mereka semua suci dan jauh dari murka dan benci Allah dan rasul-Nya. Demi Allah, yang maha pengasih dan maha penyayang, yang memberi cobaan bagi orang-orang yang beriman, fakta sejarah menjadi cobaan bagi kita, manakah yang lebih kita cintai, Allah dan Rasul-Nya, keluarga dan keturunan Rasul-Nya atau para sahabat? Apakah Allah akan meridhai kita apabila kita rela terhadap pemenggal kepala cucu Rasul-Nya sang pemuka pemuda ahli surga –siapapun pelaku dan mereka yang mendukungnya– ? Apakah Allah akan meridhai kita apabila kita percaya buta kepada para sahabat termasuk mereka-mereka yang mencaci maki Ahlul bait dan keturunan Rasul Allah saw ? Jika memang misalnya harus memilih … sekali lagi ini umpamanya : antara berpihak pada sahabat atau kepada keluarga Nabi, tanpa ragu saya akan memilih berpihak pada yang kedua, setidaknya dari hasil kajian saya selama ini jarang dan malah nyaris tidak ada celah-celah kemunafikan dari sisi para Ahli Bait Nabi (disini saya tidak memasukkan sebagian pengikut mereka yang banyak bertindak berlebih-lebihan seperti kalangan Islam Syiah). Setidaknya juga antara ucapan sholawat saya dengan sikap saya tidak bertentangan. Bacalah lebih banyak, pelajarilah lebih obyektif dan tinggalkan prasangka, analisa dengan bijak. Maaf apabila saya menyakiti anda para pengagum semua sahabat Rasul Allah, tujuan saya menulis semua ini hanya untuk mengajak anda untuk mempelajari sejarah secara obyektif. Tidak untuk menjatuhkan ataupun memaki-maki mereka, setidaknya kita tahu sejarah yang sesungguhnya terjadi. Tidak perlu mencaci para sahabat, kita cuma belajar dan mengetahui saja fakta sejarah. Lagipula mencaci maki sahabat dilarang keras oleh Rasul. Mari kita setelah ini mulai bersikap wajar dan obyektif tanpa di bawah pengaruh apapun bahkan diri anda sendiri, berpegang pada prinsip cinta dan benci karena Allah. Kita hormati semua sahabat, namun bagaimanapun kita harus tetap meletakkan rasa hormat itu dibawah ketentuan kitab suci, meletakkannya pada posisi yang memang seharusnya. 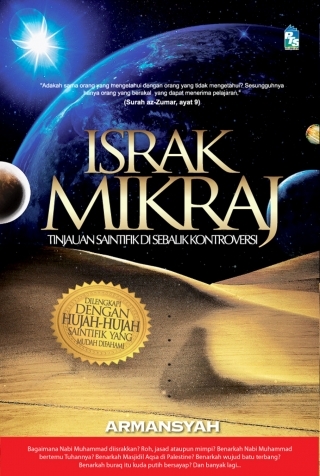 Shahih Muslim 4450: Telah menceritakan kepada kami Abu Bakr bin Abu Syaibah dan Muhammad bin ‘Abdillah bin Numair dan lafazh ini milik Abu Bakr keduanya berkata; Telah menceritakan kepada kami Muhammad bin Bisyr dari Zakaria dari Mush’ab bin Syaibah dari Shafiyyah binti Syaibah dia berkata; ‘Aisyah berkata; “Pada suatu pagi, Rasulullah shallallahu ‘alaihi wasallam keluar dari rumahnya dengan mengenakan kain bulu hitam yang berhias. Tak lama kemudian, datanglah Hasan bin Ali. Lalu Rasulullah menyuruhnya masuk ke dalam rumah. Kemudian datanglah Husain dan beliau pun masuk bersamanya ke dalam rumah. Setelah itu datanglah Fatimah dan beliau pun menyuruhnya masuk ke dalam rumah. Akhirnya, datanglah Ali dan beliau pun menyuruhnya masuk ke dalam rumah. Lalu beliau membaca ayat Al Qur’an yang berbunyi: “Sesungguhnya Allah bermaksud hendak menghilangkan dosa darimu hai ahlul bait dan membersihkanmu sebersih-bersihnya.” (Al Ah zaab: 33). Demikian, semoga membantu memberikan pencerahan. 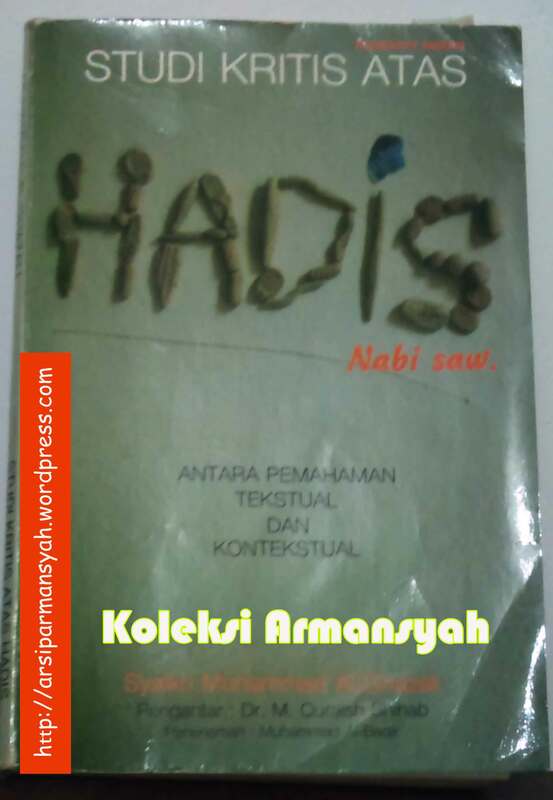 Bagaimana menyikapi perbedaan hadist ? Namun seiring dengan perjalanan waktu, ditambah dengan mulai bermunculannya pergolakan ditubuh umat Islam sendiri pasca wafatnya Nabi Muhammad SAW, maka al-Quran dan as-Sunnah tidak luput dari isyu dan pemalsuan. Proses pemalsuan al-Qur’an bisa dikatakan selalu gugur ditengah jalan, karena pada masa Nabi Muhammad sendiri al-Qur’an dalam bentuk potongan-potongan wahyu telah ditulis diatas kulit binatang, tulang-tulang ataupun perkamen (semacam kertas) dan ini dibuktikan dengan adanya beberapa sahabat yang berfungsi sebagai penulis wahyu (sekretaris Nabi seperti ‘Ali bin Abu Thalib, Tsaid bin Tsabit dan sebagainya). Disamping itu banyak diantara para sahabat Nabi yang masih hidup memiliki hafalan kuat sehingga ayat per ayatnya masih bisa saling dikoreksi satu dengan yang lain sampai pada pembukuannya dijaman pemerintahan Abu Bakar as-Shiddiq yang dilanjutkan penyempurnaan bahasa (dialektikal) al-Quran dimasa Usman bin Affan. Hal seperti itu tidak terjadi pada sunnah yang memang secara phisik, keteladanan itu telah ikut hilang dengan wafatnya Nabi Muhammad SAW. Sementara para sahabat Beliau berbeda pendapat mengenai apa yang telah mereka pelajari dari penerapan ayat al-Quran yang diwariskan oleh Nabi, sehingga antara sahabat yang satu dengan sahabat yang lain bisa saja berbeda pengamalan tergantung dari seberapa sering dia berada didekat Nabi dan seberapa banyak ilmu yang telah diterimanya. Itulah sebabnya pada jaman kita sekarang ini, bisa kita temui ada banyak sekali tafsir, hadist maupun isi do’a yang berbeda-beda. Kita juga tidak bisa menyangkal tentang adanya kemungkinan pengajaran Nabi yang tidak sama terhadap semua orang (dalam hal ini para sahabatnya). Bisa saja apa yang diajarkan oleh Nabi kepada Umar bin Khatab, berbeda dengan apa yang diajarkannya kepada Abu Bakar, apa yang diajarkannya kepada ‘Ali bin AbuThalib berbeda dengan pengajarannya terhadap Bilal dan demikian seterusnya. Dan ini semua bisa saya buktikan hadis-hadisnya. Intinya, dalam hal ini, pada beberapa kesempatan Nabi melihat dan mengukur kemampuan orang yang akan diajarinya. Bila menurutnya si A tidak akan mampu melaksanakan suatu perbuatan (misalnya berdoa yang panjang dan tenang) tentu beliau akan mengajarinya suatu do’a yang pendek dan ringkas. Sebaliknya, jika menurut pandangan beliau si B memiliki kemampuan untuk mendapat pengajaran yang detil dan kompleks, tentu apa yang diajarkannya untuk si A tidak diberikannya kepada B, namun lebih dari itu. Bukankah kita semua juga maklum, bahwa pengajaran terhadap seorang kuli bangunan akan berbeda bentuk maupun cara penyampaiannya kepada seorang sarjana ? Lalu seberapa jauh keaslian sunnah Nabi yang beredar dimasyarakat modern ini ? Dari sejarah kita ketahui bahwa penulisan sunnah dan hadist secara resmi, baru dilakukan ± 200 tahun setelah Nabi Muhammad wafat, yaitu oleh Bukhari (meninggal pada tahun 256 Hijriah/ 870 Masehi). Sementara kita semua juga tahu, jangankan untuk mendapatkan data otentik yang berasal dari mulut kemulut (lisan) dalam waktu ratusan tahun seperti itu, sedangkan suatu perkataan yang diucapkan 2 hari yang lalu saja sudah sangat sulit untuk di-ingat dan diulang secara benar dan tepat tanpa ada penambahan atau pengurangan apalagi perubahan kata demi katanya. Katakanlah ada ibu A berkata kepada ibu B : “Suruh dengan Jeruk nipis”, lalu kata itu beredar dari Ibu B ke Ibu C dan seterusnya sampai pada Ibu yang ke X, lalu tanpa disadari kalimat itu berubah menjadi : “Surf dengan jeruk nipis”. Imam Bukhari sendiri “konon” mengakui, dalam perjalanannya mencari dan mencatat hadist Nabi, beliau mendapati 300.000 sampai 600.000 yang dinilainya tidak otentik atau palsu (serendah-rendahnya berstatus hadist lemah / dhaif), dan dari total itu hanya 4000 hadist yang dianggapnya benar/ shahih (artinya dari 150 hadist, hanya ada 1 hadist yang benar menurut Bukhari). Abu Daud, salah seorang pengumpul Hadist seperti Bukhari mendapatkan 500.000 hadist dan yang dianggapnya benar hanya 4800 hadist saja. Bahkan salah seorang ulama Riyadh, Arab Saudi pada akhir dekade tahun 1980-an hingga awal 1990-an bernama Syekh Muhammad Nashiruddin al-albani telah menyeleksi ulang semua kumpulan hadist yang sudah dianggap shahih oleh sejumlah pakar termasuk Bukhari, Muslim, Abu daud dan lain-lain mendapati jumlah 2000 hadist yang bernilai Dha’if (lemah) dan Maudhu’ (palsu), dan ini dituangkannya dalam buku yang diterjemahkan kedalam bahasa Indonesia secara berseri (4 buku tebal) oleh Gema Insani Press. Sekarang katakanlah sebelum penulisan Sunnah pada masa Bukhari atau Abu Daud telah ada beberapa penulisan Hadist yang dilakukan segelintir orang secara individu, namun ini juga belum bisa membuktikan bahwa teks per teks nya lepas dari penambahan atau pengurangan, baik secara sengaja atau tidak. Para sahabat sendiri secara umum hanya mengamalkan Sunnah dan Hadist secara langsung berdasarkan tradisi, hafalan ataupun ingatan mereka dari Nabi Muhammad SAW tanpa pernah menuliskannya keatas kertas atau sejenisnya. Hal ini tidak lain karena Nabi SAW sendiri pernah berpesan kepada mereka agar tidak menulis sesuatu apapun dari perkataan Beliau selain al-Qur’an. Tindakan ini dilakukan oleh Beliau karena mengkhawatirkan terjadinya percampuran antara al-Qur’an (perkataan ALLAH) dan perkataannya sendiri (al-Hadist). Apalagi mengingat situasi umat Islam saat itu masih sangat muda dan sedang dalam tahap berkembang, sementara jumlah ayat al-Qur’an yang harus mereka ketahui dan mereka hafal sangatlah banyak dan semuanya tidak boleh salah atau tercampur dengan hafalan, tulisan atau cerita diluar al-Qur’an. Perselisihan antara sahabat Nabi sendiri menyangkut kebenaran suatu hadist malah telah terjadi sejak masa Aisyah istri Rasulullah termuda masih hidup. Pernah sewaktu Khalifah Umar bin Khatab ditikam dari belakang dan mendekati kematiannya, Hafshah putrinya yang juga salah seorang dari istri Nabi menangisi kejadian tersebut, diikuti pula oleh seorang sahabat bernama Shuhaib yang merawat luka-lukanya, melihat keduanya menangisi dirinya, Umar membentak mereka seraya mengemukakan suatu hadist Nabi bahwa orang yang ditangisi kematiannya akan memperoleh siksa ALLAH. 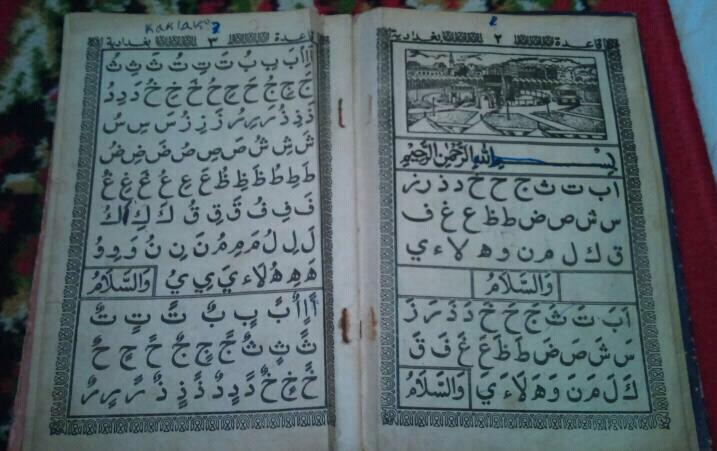 Tatkala berita ini disampaikan kepada aisyah, beliau malah menolak hadist tersebut dengan merujuk pada surah 6 al-an’am ayat 164 bahwa seseorang tidak akan menanggung dosa orang lain. Contoh lain, ketika ada seorang sahabat bernama masruq menafsirkan surah 53 an-najm ayat 7 s/d 9 bahwa Nabi pernah melihat Tuhannya, maka aisyah membantah dengan merujuk surah 6 al-an’am ayat 103 tentang sifat Tuhan yang tidak mungkin dicapai dengan penglihatan. (lihat buku: studi kritis atas hadis Nabi SAW ; antara pemahaman tekstual dan kontekstual oleh Muhammad al-Ghazali dengan pengantar Dr. M. Quraish Shihab terbitan Mizan hal 30 dan hal 37). Selain itu, keotentikan isi hadist yang sampai pada jaman kita sekarang ini pun tidak bisa dicap shahih semuanya, meskipun diriwayatkan oleh orang berkelas seperti Bukhari dan Muslim. Kita bisa melihat dalam hadist-hadistnya, Bukhari maupun Muslim tampaknya tidak memperketat kebenaran logika isi hadist yang mereka terima, sehingga acapkali kita jumpai hadist-hadist yang berbau dongeng dan diluar nalar pemikiran wajar yang justru bertentangan dengan ketegasan al-Qur’an yang memerintahkan kita mempergunakan akal didalam beragama (Qs. 5 al-maaidah: 58 Qs. 12 Yuusuf : 111, Qs. 39 az-zumar: 18 dan 21, Qs. 65 ath-thalaq: 10, Qs. 38 Shaad : 29 dan sejumlah ayat quran lainnya). Misalnya saja hadist mengenai perjalanan Isra dan mikraj Nabi yang kental sekali nuansa dongengnya, dimana disitu disebutkan pertemuan Nabi Muhammad dengan para Nabi sebelumnya yang sudah wafat dan melakukan sholat berjemaah di Baitul Maqdis Palestina lalu dilanjutkan dengan wawancara Nabi dan Jibril seputar keadaan umat akhir jaman sampai pada kisah Nabi yang bolak-balik pulang pergi dari Tuhan menuju Musa dan sebaliknya (perintah Sholat seperti membeli baju dipasar, ada tawar menawar). Belum lagi kisah Nabi Musa memukul keluar biji mata malaikat maut saat akan mengambil ruhnya atau juga kisah seputar kemunculan Dajjal dan turunnya ‘Isa al-Masih menjelang kiamat yang justru banyak saling bertentangan dan diluar nalar satu sama lain. Sayangnya umat Islam justru menerima begitu saja dengan menyandarkan bahwa semuanya bisa saja terjadi bila ALLAH berkehendak, menurut saya justru alasan yang seperti inilah penyebab rusaknya cara berpikir umat terhadap agamanya, menerima atau taqlid buta tanpa berani mengkaji secara kritis. Tanpa mengabaikan usaha ulama hadist dalam menyeleksi hadist-hadist Nabi lengkap dengan kriteria persyaratan mereka, bagi kita umat Islam yang hidup dijaman modern ini rasanya cukup sulit untuk meneliti satu persatu kebenaran suatu hadist Nabi berdasarkan rantai perawinya, selain kita tidak ada banyak waktu karena banyak pekerjaan lain, kita juga memerlukan banyak literatur atau buku-buku yang berhubungan dengannya termasuk catatan sejarah seputar latar belakang jaman para penulis hadist itu melakukan penulisan. Ulama Hadist maupun para sahabat tempat mereka mendapatkan hadist itu sendiri hanyalah manusia biasa yang bisa salah, bisa khilaf, bisa merekayasa, bisa berdusta, dan semua sifat-sifat manusiawi lainnya, disamping sifat-sifat positip yang mereka miliki. Disini kita tidak bermaksud untuk menuduh mereka khianat, fasiq atau sejenisnya. Sekali lagi kita menghormati dan menghargai mereka. Karena merekalah maka banyak kumpulan hadis dan sunnah yang dinisbatkan pada Rasul maupun keluarga dan sahabatnya sampai kepada kita. Tetapi, kita berbicara masalah obyektifitas. Bahkan jika kita mau bicara soal keterbatasan manusiawiah, seorang Nabi sekelas Nabi Muhammad sendiri pernah ditegur ALLAH 2 x karena memastikan waktu turunnya wahyu (Qs. 18 al-kahfi : 23-24) dan bermuka masam saat ada orang buta meminta pengajaran agama kepadanya (Qs. 80 ‘abasa : 1). Demikian pula dengan para istri Nabi, tidak luput dari kesalahan baik berupa rasa cemburu yang berlebihan (misalnya yang terjadi pada diri aisyah terhadap Khadijjah sehingga menimbulkan amarah Nabi SAW soal pengharaman madu), atau juga tergoda dengan kemewahan duniawi sehingga ALLAH SWT memerintahkan Nabi untuk memperingatkan mereka dan mengancam perceraian terhadap mereka (Qs. 33 al-ahzaab : 28 s.d 30). Menyangkut sahabat-sahabatnya, ALLAH juga memberi peringatan kepada Nabi Muhammad SAW untuk berhati-hati (Qs. 9 at-Taubah : 101 ; Qs. 49 al-Hujuraat : 14), apalagi sejarah telah membuktikan tindakan sebagian besar sahabat yang melanggar perintah Nabi pada peperangan Uhud sehingga menyebabkan kekalahan pasukan kaum muslimin dan terlukanya Nabi (Qs. 3 ali imron : 165), dus ditambah dengan sikap munafik dari sahabat-sahabatnya sehingga dengan kejam membantai keluarga Nabi sendiri (semoga Allah memberikan balasan yang setimpal kepada mereka). Penerapan sunnah dan hadist Rasulullah memang menjadi kebutuhan tersendiri bagi umat Islam selaku penjelas dan penerapan nyata dari al-Qur’an khususnya mengenai hal-hal yang memang tidak dijelaskan secara detail oleh quran. Kita bisa mempelajari kronologis atau sebab-sebab sebuah ayat diturunkan walau tidak semua ayat didalam al-Qur’an, Asbabun Nuzulnya sampai pada kita hari ini. Akhir dari tulisan ini, mari kita tumbuhkan sikap kritis dalam beragama, tidak asal ikut-ikutan saja, saya percaya bahwa kebenaran itu ada dan akan tetap ada meskipun yang batil menutupinya. Sikap kritis akan menumbuhkan rasa puas dalam beribadah karena yakin yang dilakukan adalah benar dan ada dasarnya. Tidak ada dosa dalam bersikap kritis, sebaliknya kita justru berdosa melakukan tanpa ada ilmunya, dan ini digolongkan oleh Nabi sebagai perbuatan Bid’ah. Sesuaikan setiap hadist dengan al-Qur’an, umumnya jika suatu perbuatan itu bersifat wajib pasti akan ada dasarnya didalam quran karena hanya yang sunnah saja yang tidak diatur oleh ALLAH dalam quran yang bisa saja dimaksudkan agar tidak memberatkan umat, karenanya jika ternyata suatu perbuatan tidak diatur oleh quran, maka kita pelajari buku-buku atau literatur lain yang ada sekalipun itu dianggap bertentangan, karena dengan demikian kita bisa memilah dan menentukan berdasarkan pemikiran rasional, apakah itu benar atau tidak. Masalah sholat misalnya, tegas dan jelas Allah menyebutkannya didalam al-Qur’an bahkan sampai pada sikap ruku’ dan sujudnya. Tetapi masalah bacaannya maka kembali lagi ini berkiblat pada apa yang diperintah oleh Allah, yaitu membaca apa yang mudah dari al-Qur’an untuk kita baca (lihat surah Al-Muzammil  ayat 20), secara perlahan (lihat surah yang sama diayat ke-4). Tradisi atau sunnah dari masa-masa kenabian dan sahabatnya yang sampai pada kita hari ini mengenai bacaan sholat ada banyak sekali dan bervariasi yang kadang satu dan lainnya tidak sama. Ini adalah indikasi kuat bahwa memang sholat sendiri tidak dibuat seragam satu warna, kita bebas memilih bacaan-bacaan yang bersifat pujian, permintaan ampun. Kebetulan beberapa diantaranya yang diajarkan oleh Rasulullah, bisa sampai pada kita saat ini melalui koleksi hadis-hadisnya. Tetapi perlu kita renungkan juga bahwa umat Islam sebelum masa pengumpulan hadis, ternyata bisa tetap melakukan ibadah ritualnya berdasar banyak sunnah yang dilakukan secara turun temurun dimasyarakat. Baik oleh masyarakat muslim yang tinggal didaerah kota suci maupun daerah dan negara lain yang sudah ditaklukkan pada masa itu. Lalu apakah sebaiknya kita tinggalkan saja seluruh hadis dan kembali pada al-Qur’an saja ? jelas sebagai orang yang cerdas, kita juga tidak bisa mengambil langkah seperti itu. Jika memang mau membasmi tikus, ya jangan bakar rumah. Artinya, kita cukup memilah dan memilih mana yang sekiranya bisa diterima dan tidak bertentangan dengan al-Qur’an dan mana yang kita mesti waspadai. Apalagi, sejarah juga mencatat bila para penafsir al-Qur’an dikalangan sahabat sendiri justru sering menanyakan cerita-cerita Israiliyat yang berkaitan dengan kisah-kisah al-Qur’an pada mantan orang-orang ahli kitab yang masuk Islam. 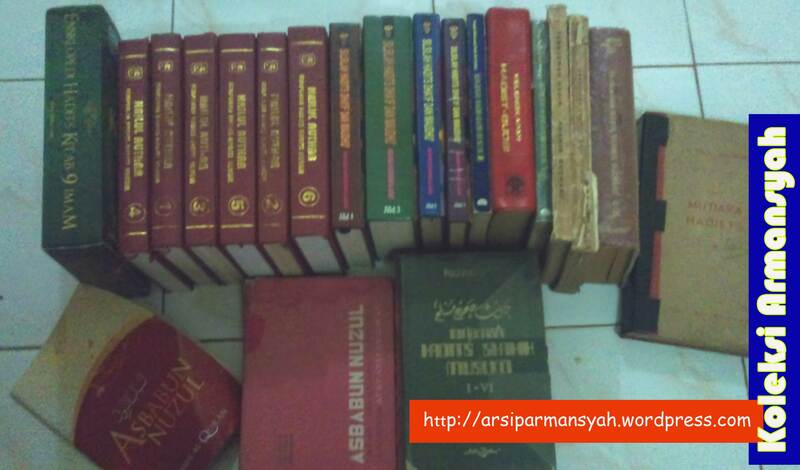 Silahkan membaca tulisan saya yang berjudul : https://arsiparmansyah.wordpress.com/2011/12/12/apakah-nabi-isa-disamarkan-wajahnya/ ditulisan tersebut saya ada menyinggung perihal ini. Kita harus menyadari bahwa setelah Rasulullah wafat, mulai terjadi friksi diantara umat Islam sendiri yang kemudian berlanjut pada pertarungan rekayasa hadis untuk mengunggulkan kelompok dan pemahamannya sendiri. Berita tidak selamanya berfungsi selaku mirror of reality. Dalam banyak kejadian, berita adalah hasil dari pertarungan wacana antara berbagai kekuatan dalam masyarakat yang melibatkan pandangan dan ideologi media massa (tempat berita itu disiarkan) dan jurnalis sendiri (bisa juru dakwah, imam madzhab, ulama dan semacamnya). Disampaikan oleh Ibnu Khaldun dalam kutipan Haekal, kita tidak harus percaya akan kebenaran sanad sebuah hadis, juga tidak harus percaya akan kata-kata seorang sahabat terpelajar yang bertentangan dengan al-Qur’an, sekalipun ada orang-orang yang memperkuatnya. Saya tidak menolak hadis-hadis yang dinisbatkan pada diri Rasulullah, baik yang datang dari kelompok Ahli Sunnah, Syiah maupun yang lainnya. Tetapi saya juga tidak bisa menerima semuanya tanpa boleh melakukan kritik dan penyaringan ulang. Sepanjang hidup saya, sering saya berinteraksi dengan berbagai kelompok orang dan pemahaman yang seringkali menjadikan hadis sebagai pijakan utama mereka dalam berpaham. Katakanlah misalnya ketika saya membahas tentang hukum musik & gambar, hukum memelihara anjing, penyaliban Nabi Isa, penyamaran wajah Nabi Isa dan lain sebagainya. Anehnya, terkadang kutipan hadisnya sendiri tidaklah benar, sering dipotong dan bahkan dibeberapa sisi bertentangan dengan al-Qur’an. Alhamdulillah, saya mengoleksi cukup banyak kitab-kitab hadis baik yang berupa software maupun hardcopy. 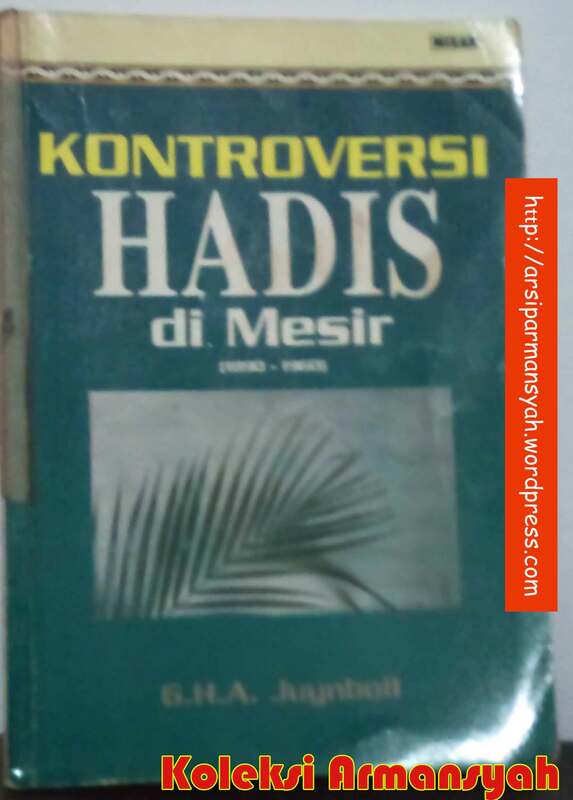 Dari kitab-kitab hadis yang banyak ini, sayapun bisa banyak belajar dan mengkaji termasuk melakukan komparasi atau perbandingan hadis. Saya tidak akan puas dan langsung menerima begitu saja sebuah hadis jika saya belum melakukan kroscek sendiri secara komprehensif apa isi lengkapnya dan bagaimana status hadis itu sebenarnya. Bahkan jika perlu cari juga asbabul wurud dari hadis-hadis tersebut. Orang yang menutup mata dari kitab-kitab hadis, adalah orang yang sombong dan buta mata hatinya. Kita mestinya mau belajar dari manapun ilmu itu berasal. 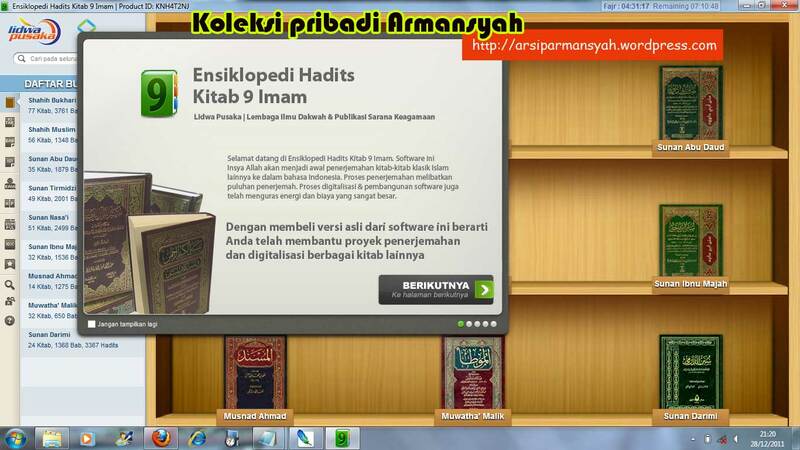 Baru-baru ini, saya membeli aplikasi Kitab 9 Imam yang secara onlinenya bisa anda akses juga di : http://id.lidwa.com/app/ . Bukan bermaksud untuk mempromosikannya, namun, melalui aplikasi-aplikasi semacam ini maka kita sebagai seorang pencari ilmu, akan mudah melakukan pencarian dan komparasi secara lebih komprehensif. Mungkin bisa membantu memberikan sedikit pencerahan …. boleh dikritisi, ditanggapi atau disetujui dan tidak disetujui. Just re-posting … siapa tahu bisa bermanfaat bagi yang baru bergabung … maaf bagi kawan-kawan yang sudah pernah menerimanya. Sudah jelas disini orang-orang yang beriman adalah umatnya Nabi Muhammad Saw, yaitu orang yang mengakui Allah Tuhannya dan Muhammad Nabi-Nya, termasuk didalamnya orang kafir yang akhirnya menerima Islam. Yahudi, Nasrani dan Shabi’in adalah gelar bagi mereka yang bukan umat Muhammad Saw. Orang Yahudi jelas merujuk pada umatnya Nabi Musa, dimana mereka-mereka ini menolak menerima Isa dan Muhammad sebagai Nabi. Orang Nasrani merujuk pada umatnya Nabi Isa as, baik mereka itu dari kalangan Israel (termasuk Yahudi) atau diluarnya, yang jelas disini orang-orang Nasrani adalah mereka yang mengakui akan kenabian Musa dan juga Isa al-Masih. Orang-orang shabiin adalah gelar bagi orang-orang yang beragama diluar umat Muhammad, Isa dan Musa, ada juga yang mengartikannya sebagai orang yang gemar bertukar agama, ada juga yang berpendapat bahwa Shabiin ini gelar bagi orang-orang penyembah bintang, namun saya pribadi lebih memilih pendapat yang pertama. Satu catatan awal, bahwa orang yang kafir lalu Islam tidak lagi disebut Yahudi, Nasrani atau Shabiin tetapi ia disebut orang yang beriman alias Muslim, sehingga ketiga istilah tersebut kontekstualnya merujuk pada orang-orang yang belum atau tidak mengakui Islam secara kaffah sesuai ajaran Muhammad Saw. Ayat ini sambungan dari ayat sebelumnya, kita lihat bahwa disini konteksnya hanya beriman kepada Allah, hari kemudian dan mengerjakan amal yang baik. Ayat ini sama sekali tidak disebutkan mengenai keimanan terhadap apa yang diturunkan kepada Nabi Muhammad Saw (Islam Kaffah, totalitas). Maksudnya, siapa saja diantara ketiga golongan tersebut (Yahudi, Nasrani dan Shabiin) yang bersih Tauhidnya, tidak mengadakan sekutu bagi Tuhan, percaya adanya hari pembalasan, hari dimana semua rahasia dibuka, semua perbuatan baik dan buruk akan mendapat balasan dan selama hidupnya mereka senantiasa mengerjakan amal kemanusiaan, berbuat baik kepada semua orang, semua makhluk maka mereka-mereka dari ketiga golongan tersebut akan menerima ganjaran dari sisi Allah. Kita baca dari dialog diatas, Nabi sama sekali tidak mengejar pengakuan para pendeta ahli kitab itu terhadap klaim kenabiannya, setelah ajakan kepada seruannya tidak diterima, Nabi akhirnya mengajak pada nilai-nilai luhur monotheisme, artinya kira-kira : tidak apa anda tidak mengakui saya sebagai Nabi Tuhan asalkan anda tetap memegang prinsip satu Tuhan. Dan bila kita kembalikan konsep ini pada semua cerita yang ada dalam al-Qur’an akan semakin jels betapa masalah monotheisme ini sangat memegang dominasi kitab suci. Nyaris semua ayat berupa seruan terhadap ketunggalan Allah tanpa sekutu, dan disisi lain, konsep ini pun selaras dengan ajakan para Nabi dan Rasul sebelum Muhammad Saw diutus. Jika ini digambarkan sebagai pluralisme dalam beragama, mungkin benar, tetapi ingat, pluralisme yang kita bahas adalah pluralisme yang sifatnya monotheisme, bukan pluralisme campur aduk semua konsep ketuhanan. Lebih jelas lagi, konsep Trinitas, Trimurti dan sejenisnya tidak termasuk dalam tatanan ini karena mereka jelas bukan bersifat monotheisme. Secara matematika yang sederhana bahwa monotheisme itu kurang lebih hitungan 1 + 2 = 3 dan bukan 1 + 2 = 1. Jika dia sudah menyalahi konsep rasionalisme standar seperti itu maka dia disebut menyimpang. Islam artinya berserah diri, damai dan pelakunya disebut Muslim dan Muslimah. Maksud berserah diri disini berserah diri kepada Allah yang lam yalid walam yulad, Allah yang Qiyamuhu Binafsihi ataupun Allah yang Ahad. Saat Allah menyebut agama disisi-Nya hanya Islam, maka siapa saja dari golongan yang meyakini akan ke Ahadan Allah, ke- lam yalid walam yuladnya Allah, ke-Qiyamuhu Binafsihi-nya Allah maka mereka termasuk dalam defenisi Islam pada ayat ini sekalipun mereka misalnya tidak mengakui akan kenabian Muhammad. Lalu bagaimana bisa orang yang tidak mengakui kenabian Muhammad dimasukkan dalam golongannya Allah ? 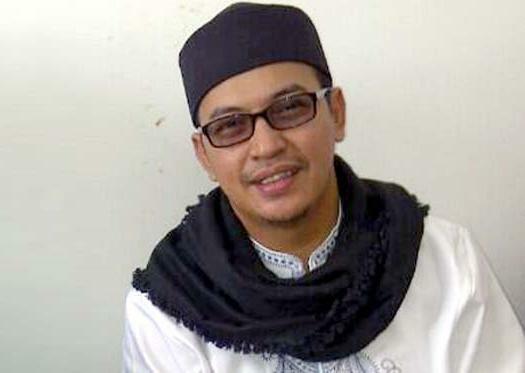 Kita harus ingat bahwa Allah itu bersifat adil, dan adilnya Allah itu tidak bisa kita batasi dengan keadilan menurut permodelan peradilan para penegak hukum kita. Sekarang, bagaimana Allah bisa kita sebut adil jika Dia menyiksa umat yang notabene hidup dipedalaman, jauh dari jangkauan orang luar dan peradaban modern apalagi sampai bisa mengenal dan memeluk Islam sebagaimana umat Muhammad ? Sementara fakta bahwa diantara mereka belum ada Rasul yang diutus Allah ? baik Rasul dalam makna Nabi maupun Rasul dalam makna luas seperti ustadz, ulama, cendikiawan muslim dan sebagainya. Karena itulah kenapa Islam tidak sesempit yang dipahami banyak orang, Islam itu begitu universal sehingga saking universalnya Islam disebut sebagai rahmatan lil ‘alamin, Islam pembawa rahmat bagi alam semesta, bagi seluruh makhluk. Hanya orang pandir saja yang ribut mengenai Islam malah gontok-gontokan saling berebut mengkafirkan antar jemaah padahal mereka sendiri umumnya sama-sama Islam, sama-sama bertauhid. Lalu, dalam realitas sekarang ini, masih adakah orang-orang yang dimaksud oleh Qs. al-Baqarah 3 ayat 62 diatas ? Saya jawab – MASIH -. Kita tahu orang-orang Yahudi masih hidup dan sebagian besar dari mereka bukan pemeluk ajaran Isa entah ajaran monotheismenya maupun ajaran penyimpangan model Paulus dengan polytheismenya, mayoritas orang Yahudi yang hidup sekarang adalah mereka yang menjunjung tinggi kenabian Musa as., mereka adalah orang-orang yang bertauhid kepada Allah. Tetapi fakta juga bahwa selalu ada peluang 1 dari 100 orang Yahudi yang bejat adalah seorang Yahudi yang tauhidnya oke, tingkah lakunya oke, gemar berbuat kebaikan dan percaya akan hari berbangkit. Itu untuk kaum Yahudi, lalu bagaimana dengan kaum Nasrani ? Sudah menjadi rahasia umum bahwa tidak semua pemeluk Kristen dewasa ini setuju dengan paham Trinitas, fakta bahwa ada juga yang menyebut diri mereka orang-orang Kristen Yehovah dengan Watch Towernya. Jemaah ini menolak keras penuhanan al-Masih, bagi mereka Isa adalah Isa, seorang manusia dan Isa bukan Tuhan. Bagi mereka Tuhan adalah satu, tidak beranak dan tidak juga menjelmakan diri sebagai makhluk. Golongan ini jelas secara prinsip memenuhi standar Tauhid pada surah al-Baqarah ayat 62. Lalu bagaimana pula dengan kaum Shabiin ? Saya ingat pernah membaca pengalaman pengembaraan almarhum Ahmad Deedat ke Afrika Selatan ditengah masyarakat Zulu, disana ia menemukan kaum yang menyebut Tuhan mereka dengan nama uMVELINQANGI, lalu di India menurut beliau ada juga yang menyembah Tuhan bernama PRAMATMA, Bangsa Aborigin di Australia Selatan memanggil Tuhannya dengan istilah ATMATU dan semua Tuhan-tuhan tersebut berdasarkan penyelidikan Ahmad Deedat tidak mencerminkan sistem polytheisme, artinya itu adalah konsep Tauhid atau monotheismenya masing-masing kaum (Lihat : Ahmed Deedat, Allah dalam dalam Yahudi, Masehi, Islam, terj.H. Salim Basyarahil, H. Mul Renreng, Penerbit Gema Insani Press, Jakarta, 1994, hal. 21-28), dan ini mengindikasikan terpenuhinya kriteria Qs. al-Baqarah ayat 62. Dengan demikian, terbukti bahwa ayat al-Qur’an memang benar dan selalu uptodate, tidak ada kontradiksi antara satu dengan lain ayat atau konflik antar ayat dengan kenyataan. Pertanyaan susulan : Kalau begitu untuk apa Muhammad diutus ? orang cukup monotheisme saja selesai … masuk syurga. Saya jawab, bahwa sebelum pengutusan Muhammad, semua Nabi dan Rasul diutus bersifat kedaerahan, artinya mereka diutus untuk masing-masing lokasi dimana mereka berdomisili, belum ada Rasul yang mencakup semua wilayah jikapun Isa disebut-sebut sebagai orangnya maka ini hanyalah karang-karangan orang saja, sebab sepanjang hidupnya Isa al-Masih tidak pernah berdakwah diluar bangsa Israel bahkan termasuk gerakan dakwah para murid-muridnya. Faktor lain diluar masalah kedaerahan tadi, pengutusan Muhammad berfungsi juga sebagai pelurus jalan, pembaik akhlak. Fakta juga berbicara bahwa tidak ada ajaran Nabi dan Rasul sebelumnya yang masih murni tak bernoda, semuanya sudah dimanipulasi, semua sudah didistorsi tangan-tangan jahil manusia sehingga tercampurlah antara ajaran langit dengan ajaran bumi, antara benar dan salah, mitos berbaur dengan fakta. Jika sudah demikian adanya, bagaimana bisa konsep monotheisme Tuhan menyebar keseluruh dunia sebagai sifat Rahman dan Rahimnya Allah ? Fakta, berapa banyak orang jawa yang ber-KTP Islam tetapi mereka tetap percaya, tetap takut, tetap hormat, tetap memberikan sajen pada setan penghuni laut selatan ? berapa sih jumlah total orang Yehovah seluruh dunia ? berapa prosentase orang Yahudi yang bertauhid diantara milyaran manusia didunia ? Ini artinya tanpa pengutusan Muhammad, secara kausalita, secara hukum alam sebab akibat, tidak ada jaminan konsep-konsep Monotheisme Tuhan menyebar dan merangkul keberbagai benua. Bukti harus ada wadah yang mempersatukan, dan wadah itulah Islam. Pertanyaan lagi : okelah kita akui Muhammad, tetapi lantas apa beda orang Islam yang mengikuti Muhammad dengan kaum monotheisme diluar umat Muhammad ? toh semuanya menurut surah al-Baqarah tadi sama-sama mendapat ganjaran dari sisi Allah ? Saya jawab : Susu saja ada yang standar dan ada yang gold. Misal saya ambil contoh susu anak saya bermerek Chil-Kid, ada 2 versi, Chil-Kid biasa dan Chil-Kid Platinum. Dua-duanya sama-sama susu pertumbuhan, sama-sama produksi Morinaga tetapi berbeda, yang satu standar artinya apa yang biasanya ada dalam susu pertumbuhan merek lain pun terkandung didalamnya dan yang Platinum ada beberapa penambahan nutrisi, peningkatan gizi dan sebagainya. Jadi ada perbedaan value. Anda mau yang biasa-biasa saja ya beli saja Chil-Kid standar, tapi kalau anda mau yang lebih … maka belilah Chil-Kid yang Platinum. Itu makanya syurga Allah itu bertingkat, tidak hanya tingkat dalam kedudukan antar umat Muhammad berdasarkan takwa mereka tetapi juga tingkat dengan diluar umat Muhammad. Sekarang, kalau anda bisa menjangkau tingkat Platinum … kenapa masih harus memilih yang biasa saja ? Atasan saya dikantor paling benci dengan orang yang kerjanya hanya bersifat standar, artinya karyawan yang bersangkutan tidak punya nilai lebih, kerja ya masuk pas jam masuk, pulang pas jam pulang, akhir bulan dapat gaji. Tapi sama sekali tidak ada Value Add darinya. Dunia ekonomi pun berprinsip sama, ingin mendapatkan nilai tambah. Bahkan menurut Nabi sendiri, orang yang harinya sama dengan kemarin adalah orang yang rugi. Maknanya : setiap hari setiap orang itu harus memiliki nilai tambah, minimal bagi dirinya sendiri. Saat seseorang tidak mempunyai nilai tambah, maka di rugi. Saat seseorang hanya menginginkan monotheisme standar, dia juga rugi. Kecuali dia menerima konsep monotheisme platinum, yaitu menjadi orang yang beriman, maksudnya beriman tidak hanya kepada monotheisme Tuhan namun juga mengikut konsep monotheisme Kaffah yang diajarkan oleh Nabi Muhammad Saw. Terakhir … jika anda digaji standar Rp. 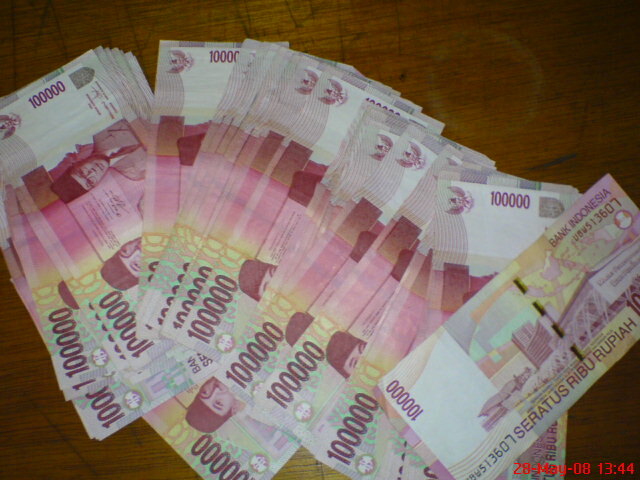 1.000.000 / bulan terus selama bertahun-tahun tidak mengalami peningkatan apa keluhan anda ? intinya anda merasa dirugikan. Lalu ada kesempatan bagi anda untuk mendapatkan gaji diatas itu dan terus bertambah berdasarkan nilai lebih anda diperusahaan… masih tidak maukah anda mendapatkannya ? Jika jawaban anda mau, maka mari sama-sama kita mengikuti apa yang diajarkan oleh Muhammad.